MACON, Ga. – Georgia Farm Bureau presented Banks County elementary teacher Dr. Wendy Fuschetti its 2017 Georgia Agriculture in the Classroom Teacher of the Year Award during the organization’s 80th annual convention Dec. 3 on Jekyll Island. Fuschetti, who teaches third grade at Banks County Elementary School (BCES) in Homer, was recognized for incorporating information about agriculture into her math, science and social studies classes to teach her students how agriculture impacts their daily lives. As the award winner, Fuschetti received a $500 award and will receive an expense-paid trip to the National Ag in the Classroom Conference in Portland, Maine in June 2018. She will also be invited to present a workshop on her teaching methods at the Georgia Farm Bureau Educational Leadership Conference next March. Fuschetti’s dedication to incorporating agriculture into her classes as a means of teaching her students the math, science and social studies skills they need comes from having grown up in a city the first ten years of her life. As a teacher, Fuschetti has made it her mission to provide her students with the green of agriculture that she discovered as a child when she moved from the city to the country. She does this by teaching her students and their families the value of growing a garden, the process of planting seeds and growing them to harvest along with the joy of preparing meals from food they grow. Realizing that many of her students don’t have space at home for large gardens, Fuschetti has taught her students about vertical and container gardening. “My students learn the importance of healthy eating habits while learning to measure and calculate area and perimeter, length, width and height. Once we have fresh vegetables, my students learn about recipes and measuring quantities,” Fuschetti said. Fuschetti, who has taught school for 21 years, has taught at BCES for 15 years. She previously taught at Lake Country Elementary School in Florida where she was the 2001 Teacher of the Year for the school. She was named the 2006 BCES Teacher of the Year and the 2006 Banks County School System Teacher of the Year. In 2007 Fuschetti received the Youth Science & Technology Teacher of the Year Award from the Pioneer RESA in Cleveland, Ga. In 2011 Fuschetti received the Northeast Georgia Junior Achievement Teacher of the Year Award. She is a member of the Professional Association of Georgia Educators, the National Science Teachers Association and has held a national board certification from the National Board for Professional Teaching Standards since 2003. 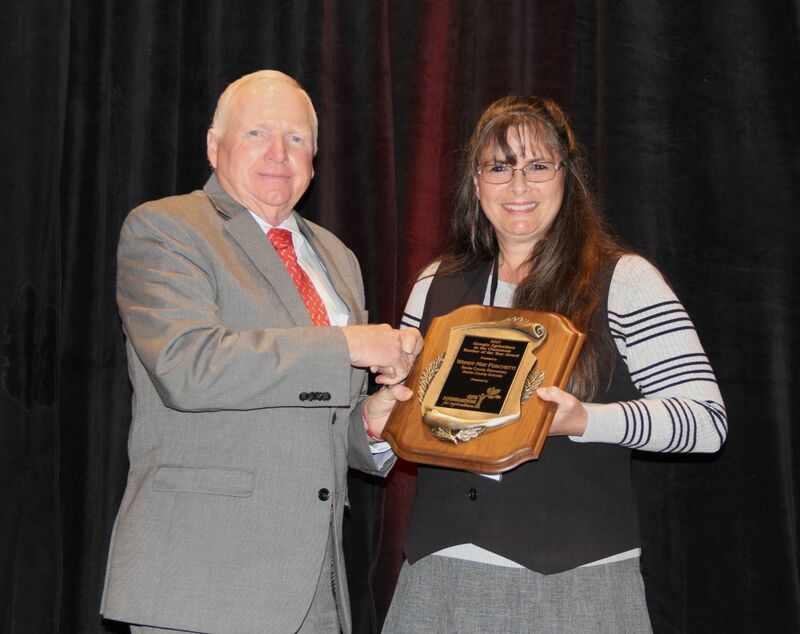 CUTLINE FOR GEORGIA EXCELLENCE IN TEACHING AGRICULTURE AWARD: Banks County teacher Dr. Wendy Fuschetti accepts the 2017 Georgia Agriculture in the Classroom Teacher of the Year Award from Georgia Farm Bureau President Gerald Long on Dec. 3 during the 80th Annual GFB Convention on Jekyll Island.